Little Boy is an atomic bomb dropped on Hiroshima and many people died of leukemia. The United States dropped the bomb to show how strong they were. The Japanese were ready to surrender when the United States dropped the bombs. 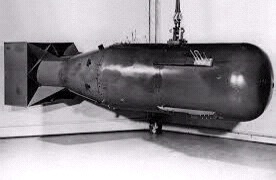 They actually dropped two bombs–the Little Boy and Fat Man–in two places. Fat Man was dropped in Nagasaki and Little Boy was dropped in Hiroshima, like I said. It dropped above a bridge and a building called the Prefectural Industrial Building in Hiroshima, and it exploded 600 meters above the ground. Nowadays, it’s part of the Hiroshima Peace Memorial Park. When the bomb dropped, every wooden house within three kilometers would be blown over. People had many injurues. Their skin fell off and many children died, too. About 35% of the people in Hiroshima died that day. People did survive the bomb. Leukemia is an atomic bomb disease and it is cancer. People who were pregnant would sometimes give leukemia to their babies. Please read Sadako and the Thousand Paper Cranes by Eleanor Coerr. It’s about a girl who, 10 years after the bomb, gets leukemia. =I think the United States should have waited to see if they were going to surrender and I think they should have dropped the bomb on the Japanese army base and not on the public. In which Eric bizarrely, suffers from acrophobia, I find some yarn, and oh yeah we visit a castle. In which a Hufflepuff and two Ravenclaws walk into a bar, the Hogshead of course because we’re dark like that. Three Broomsticks, pah. Wow. I can’t imagine what it must have felt like to go to those places, Lu. I can tell from your writing that it impacted you a lot. I think I would have been very sad to see Hiroshima, but it’s so very important to learn about! I’ll be sure to read Sadako and the Thousand Paper Cranes! That’s a very sad story, Lu. Thanks for educating us!